PUBLISHER: U.S. Games Systems, Inc APPROXIMATE BOX SIZE: 3.5" x 5.5"
AUTHOR: Paulina Cassidy APPROXIMATE CARD SIZE: 3" x 5"
$0.00 shipping for each additional eligible item you buy from riverspryte401. They Spoke to My Heart. From the moment I saw these cards, I knew they were meant to be mine. They are beautifully drawn and of outstanding quality. They come with a corresponding booklet, which was helpful for familiarizing myself with them. They are on nice heavy stock, so I expect them to have a long lifespan. They also come in a sturdy, lidded box that will keep them safe from harm. You can tell upon opening the box that much love and contemplation went into the design of this deck. I absolutely love them and have already formed a bond that I expect will continue for a long while. If you are thinking about purchasing this deck, you have nothing to worry about. 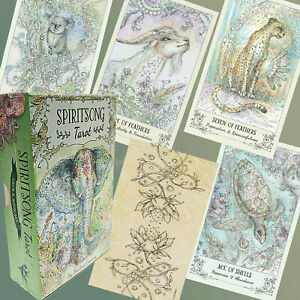 You will not regret for an instant having these beautiful animal spirit guides in your life. I love these cards they are truly beautiful and inspiring. I did my first ever reading for myself with them and I could feel the energy and positivity. They're very easy to interpret even for a first time tarot user like myself. The animals depicted are true to their descriptions. This was my first Tarot deck for my personal use. I am very picky when it comes to card decks, I have had several Oracle decks. I took my time selecting and I’m SO glad I waited for this deck! The artwork is beautiful and it definitely wanted to work with me! Highly recommend. Beautiful artwork and energy. I love this deck so much that I bought a second one for another person in my life who needed it. The artwork is breathtaking, and it’s full of positive energy. Highly recommended. 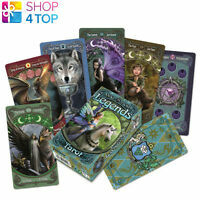 Absolutely gorgeous tarot deck. Follows traditional Rider-Waite (follow the numbers of the suit for easy interpretation) My new favorite deck!